Granada is one of the iconic cities of the world. It stands for the culture of Al-Andalus, composed of Moslems, Jews, and Christians, who lived together in the legendary convivencia of the Spanish Middle Ages. Al-Andalus gave rise to an intellectual vanguard whose achievements can be compared only with those of classical Athens, Ming China, or Renaissance Italy. 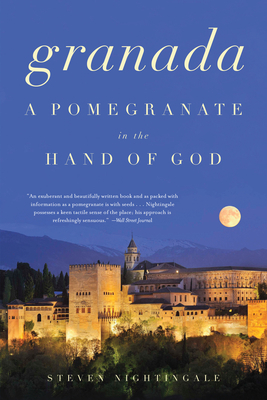 Granada resident Steven Nightingale excavates the rich past of his adopted city and of Al-Andalus, finding a story of utopian ecstasy, political intrigue, religious exaltation, and scorching anguish. Granada witnessed a flourishing of poetry, and constructed the Alhambra, one of the most celebrated buildings in Europe. Al-Andalus brought to Europe the first modern translations of Greek philosophy, advanced mathematics, science, medicine and music, as well as transcendent mystical texts. Yet Ferdinand and Isabel's conquest of Granada in 1492 meant the end of the culture whose achievements would empower and enrich the rest of Europe. In the story of Granada, Nightingale finds our story, all its violence and possibility and beauty, its spiritual longing and artful dreams. It is a story that shows how we can work together, and what we can create together. And how our best work can be destroyed. Steven Nightingale is the author of two novels and six books of sonnets. He lives in Woodside, CA, with his family.